If absolute authenticity is a main concern, you'll need settle on a time period for construction. 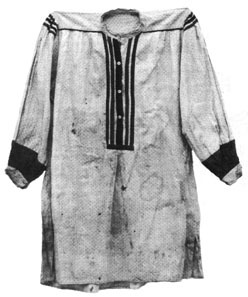 Since this shirt was first copied from 18th Century British shirts, it remained relatively unchanged. But, prior to 1890, it was hand sewn with needle and thread. After 1890, use a sewing machine with relatively wide stitches, to simulate the old hand-crankers. 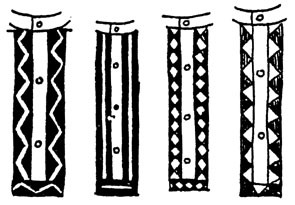 Note types of hand-stitch. ANY cotton pinstripe, calico. gingham, or polka-dot or plain is a suitable material. After 1890, preference was given to lighter colors. You'll find that the standard 45 inch bolt width is perfect. Unless the stripe or design requires a particular orientation running the length of the bolt, any manner of laying out the cloth will work. These instructions wil1 presume the latter. The entire project is surprisingly easy! All pattern pieces are squares or rectangles. Total yardage required will average 2 1/2 to 3 yards. (2) Cut out the back and front. Gather one end of the back to match the straight length of the yoke. Pin both pieces of the yoke to the back, as shown. Face the patterned (right) sides to each other with the back sandwiched in between (Unprinted side is called the "wrong" side). Sew together about 1/2" from the edge. (3) Fold the front piece lengthwise. Slit nlong the fold a length equivalent to your sternum (breastbone) from base to throat. At the base of this slit, cut n snip across into the fahric 1" deep so that when you unfold it, you have an inverted "T" with a 2" cross bar. 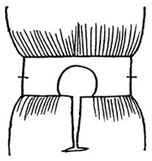 (4)-A- Gather each side of the front from the outside edges, leaving 1 1/2" ungathered on either side of the sternum slit. 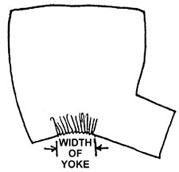 The gathered distances should equal the two fronts of the trimmed yoke. (5) Stretch out the assembly, right sides of the front and back still facing each other, and hold it up hy the edge of the seams you have just sewn. Lay it down, and bring the second, unattached, yoke edges up to match. Note: Choose between step A or B. If you choose the more commonly seen step A, pin it together as shown and sew the edges together. If you choose the newer, more modern form, move on to step B below. 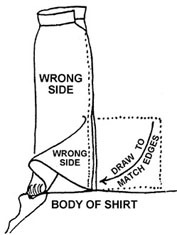 -A- Some shirts have this second yoke simply sewn on to the other at the two previous seams. This can be done by hand or with a sewing machine. 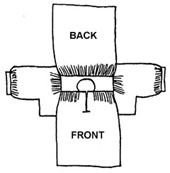 -B- Some shirts have this second yoke attached with another "hidden" seam. Although this hidden seam will actually be on the unseen underside of the finished shirt, it will add to the quilted appearance of the back of the yoke. Place the yoke assembly across your knee. Now, you're a genuine tailor! Fold the inner unattached yoke piece over to the front, smoothing it out over your knee, and folding the edge under so it matches the previous seam. Pin as necessary to hold in place. The next will have to be handsewn whether or not the rest of the shirt is machine-sewn. Stitch through the second yoke and the previous seam, but NOT through the front of the first yoke. You will have to undo the pins as you go. -B- Place the front and back pieces together with both their right sides facing each other. Pin the two gathered perts of the front piece to the fronts of the nearer yoke piece. Leave the other yoke piece unattached, for now. 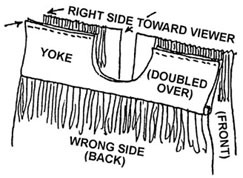 Be sure to leave the 1 1/2" ungathered parts of the yoke unattached and extending into the neck opening, as shown. Sew together where pinned, about 1/2" from the edge. 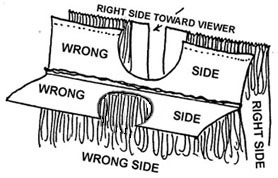 (6)-A- For the hreast facing, tear or cut two strips 1 1/2" to 2" wide, the length of the front slit. Sew them to the slit sides, cloth right sides facing, with a 1/2" seam. -B- Then, fold around and inward as shown, and sew through the four thicknesses of cloth along the previous seam. Press flat to make a crease, and sew along the edge of that crease. -D- Next, gather the material below the opening with a running hand stitch. Pin the bottom of the facing together, overlapped as if buttoned together. -E- Cut out a piece of material about 2" by 3", folding and pressing the edges under with an iron until you have a piece about 1" by 2". Lay it squarely over the bottom of the facing and the gathered area, and sew into place. -A- Simple Method: Fold the neckband piece lengthwise, wrong side out. Sew it together on one end and down the open length, leaving one end open. Turn it right side out (pencil or knitting needle would help). Place the neckband on the yoke edge, end flush with the vertical edge of one facing, and sew together. Be sure that the seam will wind up underneath the finished neckband when worn. Just before you reach the other end of the yoke opening, clip off excess neckband 1/2" beyond end, and turn the open end of the neckband inside so you can finish sewing. Stitch the neckband to the yoke a second time, and close the end of the neckband as you complete sewing it to the yoke. 1. Pin neckband piece to the neck opening, with ends folded back, matching the front facing edges. Sew 1/2" from edge twice. 2. At intervals of every V to 3/4", clip cuts into the sewn edge about 1/4" deep. Don't cut through the freshly sewn seam! 3. Fold the neck band over, starting in the center. Begin pinning and matching the tucked edge with the previous seam to the yoke. Once pinned, sew the open ends and stitching down the neckband. Stitch along the outer crease of the neckband, as well. 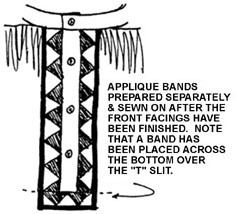 -A- If the gussets were cut as separate pieces, attach them to one end of the long side of the sleeve pieces. -B- Fold a sleeve piece lengthwise, bringing together the long edges and letting the gusset hang loose. Mark the short edge at the gusset end about half way along the edge. -C- Unfo]d and gather between the marks to match the side of the yoke. -D- Taper the ends of thc sleeves in a little by rolling in their corners. Roll in about 3/8", and make the taper about l 1/2" long. Pin to hold temporarily. -E- Place sleeve to previous assembly, right sides facing, with the gusset to the front of the shirt. Pin together, and sew from Point A to Point E.
- Repeat for the other sleeve. (9) -A- Cut the cuffs 2" longer than the loose wrist circumference. The piece should be 2" to 4" wide. Narrower cuffs seem to be more common, but there is room here for personal preference. -B- Fold lengthwise. right sides facing and sew each end with a 1/2" hem. Turn right side out, press with a hot iron (or flatten on a bent knee), and stitch all the way around 1/4" from the edge. 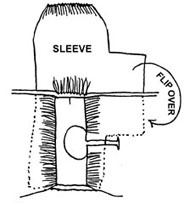 -C- Gather the now narrowed sleeve end, so that the gathered length matches the length of the cuff. Pin together, right sides facing. Sew about 1/4" from edge. You can now remove pins that kept taper from unrolling. 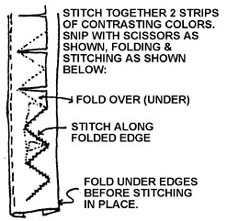 (10)-A- Folding the right sides of the cloth face to face, begin sewing the long sides of the sleeve together, starting 1" away from the cuff, about 1/2" away from the edges of the cloth. Stop when you get to where the gusset begins on one sleeve side. You will now match the sleeve side without the gusset to the side of the gusset. You will find that the gusset's edge is at a right angle to the sleeve side, and to the seam you've been sewing. Grasp the corner of the gusset and pull it over, keeping the sides facing so you can continue sewing a seam. DO NOT FOLD IT - just draw it over. -B- Stop at the corner of the gusset, and repeat on the other sleeve to this point. When both sleeves are finished to this point, you should have something that looks like this: the front, gusset, and sleeve will all be sewn together. The back will be unattached from the junction of the sleeve & gusset all the way down to the tail. -C- Sew only the open edges to each other, from the sleeve/gusset/back juncture down to 3" - 5" from the bottom. Make sure all the extra gusset material stays clear of the seam. Repeat on the other side of the shirt. (11)-A- Hem the edges of the bottom slits. -B- Lay the shirt flat, after turning it right side out. Match up the bottom by folding over a hem, pinning and pressing with an iron if necessary. Put it on to see how it hangs on you. With help from a mirror or from some one else, you may find it necessary. (12) For button holes, cut slits about 1/2" long as needed and stitch tbe edges with an overcast or locking stitch. There is one in thc neckband, 2 or 3 on the front opening, and one on each cuff. Sew on button, preferably bone. Voila! You're done! Sew onto the fabric making at least a dozen passes with doubled thread. Wrap the thread around what has been used to attach the button a few times. Then pass the needle through to the back, knot and tie off. Use your button holes to mark where the buttons should be before sewing them to the fabric. 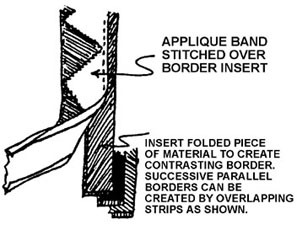 The cut & snip and overlapping welt methods are shown below, with other design ideas. Also, refer to old photographs and postcards for ideas. Explore other areas of NativeTech... About NativeTech Beadwork Birds & Feathers Clay & Pottery Games & Toys Leather & Clothes Metalwork Plants & Trees Porcupine Quills Stonework & Tools Weaving & Cordage Food & Recipies Poetry & Stories Scenes from the Eastern Woodlands Contemporary Issues Links to Native Art Resources NativeTech's List of Messageboards More through NativeTech's Home Page!